1. In large bowl, combine all ingredients except cranberries. Stir to combine. 2. Spread granola mixture onto a greased cookie sheet and bake in 300 degree oven for 20 minutes. 3. Let cool and add cranberries. 4. In a dessert cup, layer 1/2 cup vanilla Greek yogurt, followed by 1/2 cup fresh fruit, cut into small chunks, then 1/4 cup vanilla yogurt. 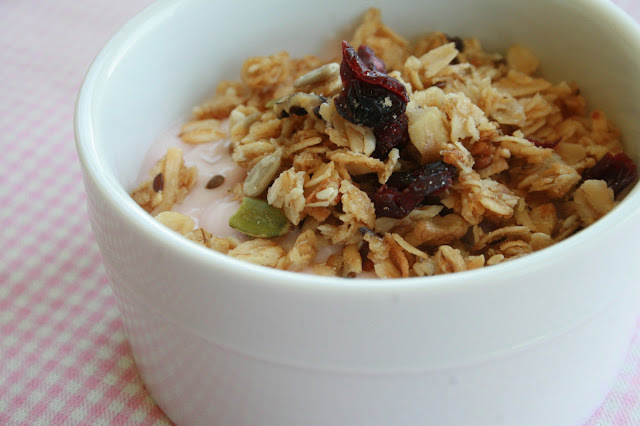 Top with a 1/3 cup homemade granola.